Every year on December 5 which is Walt Disney's birthday I visit his grave site. 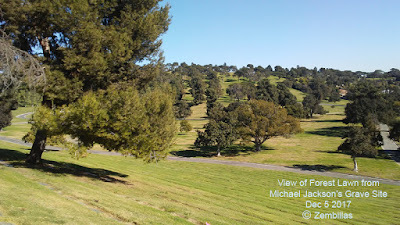 On my latest visit last month I took some time to take photos of the grave sites of several of the famous people who are also interred at the Forest Lawn Cemetery in Glendale California. Perhaps the most beautiful cemetery in the world. It's a who's who of some of the great stars who ever lived. They left a lasting legacy in Hollywood and in other areas of entertainment and American culture that endures to this day. 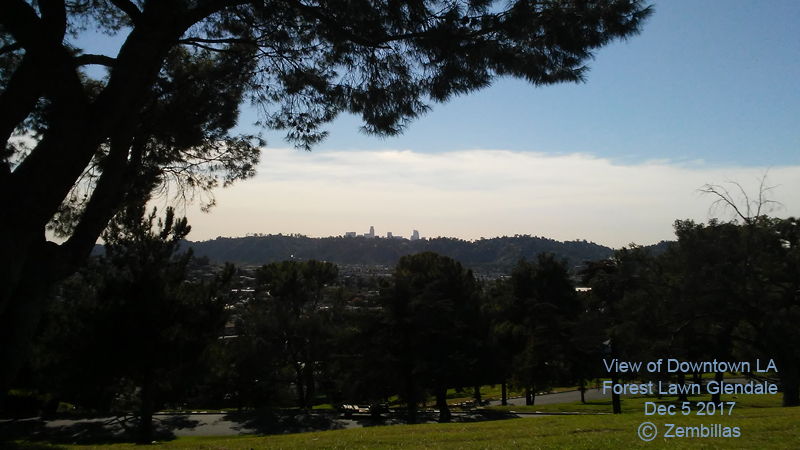 Let's start with this shot which is a view of downtown Los Angeles from the area around Disney's grave. Notice the city skyline in the center of the photo way off in the distance above the tree line. This is Alan Ladd. He's best known for his lead role in the all time classic western "Shane" from 1950. A great movie actor. Here's Casey Stengel. He was the manager of the champion New York Yankees in the 1950's and the first manager of the New York Mets. He was quite a character. At the bottom of his bronze plate is this memorable epitaph of his... "There Comes A Time In Every Man's Life And I've Had Plenty Of Them". Next up is the immortal Clara Bow. She's known as the "IT" girl because she had "it" which was also the title of her best known film in 1927. She was the biggest female star in Hollywood during that phase of the silent movie era. The first on film to embody the spirit of the contemporary 20th century woman. The one and only Errol Flynn. The greatest of the Hollywood swashbucklers. He was the movie's biggest actor in the late 1930's. The little red flower is my homage to him. He was one of my favorite movie stars growing up as a kid. I was captivated and heavily influenced by his action films. This is one of Hollywood's most famous couples. The husband and wife team of George Burns and Gracie Allen. They were popular radio stars and they also had a long running TV series in the 1950's. Another couple from the golden age of Hollywood. Gene Raymond and Jeanette McDonald were husband and wife. They were very popular movie stars in the 1930's. Did you ever see the 1939 movie "Heidi" with Shirley Temple? If you did then you'll recognize this actor. This is the grave of Jean Hersholt who played the memorable role of Heidi's grandfather. This entertainer needs no introduction. Michael Jackson is entombed in this building. There's 24 hour security here and no way anyone can enter unless you're family or you have special permission. I chose to feature Michael as a youngster in his early days when he burst onto the scene with his brothers as The Jackson 5. He's a native son of Gary Indiana. This is what the view of Forest Lawn looks like from Michael Jackson's grave site. It's a huge cemetery with at least 250,000 graves I'm told. The great Nat King Cole. A voice as smooth as satin and silk. He was one of the finest singers in the history of American popular music. 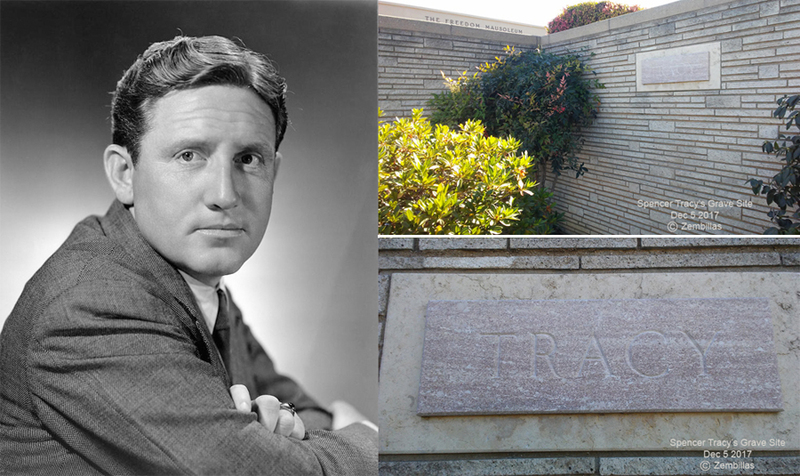 Here's the final resting place of Spencer Tracy. Another of Hollywood's most talented actors. The photo at the lower right is a close up of his name at the grave site. Last but certainly not least among the pantheon of Hollywood's best is this building where some of the greatest of all time are resting. Photos aren't allowed inside so I took a picture of the structure and am featuring 4 of the many individuals whose earthly remains are contained therein. Starting with Elizabeth Taylor at the upper left and Red Skelton just beneath her. He was a hugely popular comedian who had a weekly TV variety show that lasted for many years. 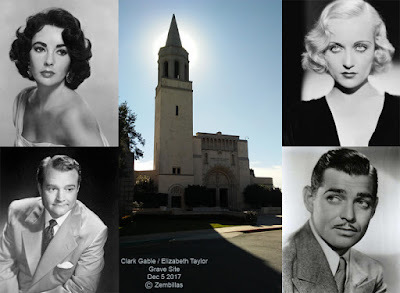 At the upper right is Carol Lombard who died tragically in a plane crash in the early 1940's. She was a movie star and married to Clark Gable who's pictured below her. They're buried next to each other. There are many more stars and memorable individuals buried at Forest Lawn. This is a look at a few of them. If you're ever in the LA area make it a point to visit Forest Lawn. It's a fascinating place. Hope you enjoyed this presentation.